The half-time of the 1984 Super Bowl featured a 45 second ad that would be declared in 1995 the best ad of the last 50 years5. The commercial, directed by Ridley Scott (Alien, 1979, and Blade Runner, 1982) for the Apple Corporation, announced the imminent arrival of the Macintosh computer. The ad cost $1.6 million to produce, and Apple Corporation paid $500,000 for the one-minute time slot in which it ran. It ran only once. The runner appears, again briefly. The voice has intoned over the last three shots: "A garden of ideology where each one can bloom, secure from the pests of contradictory forces," the word "forces" hitting over the image of the runner. What Garden do they Mean? Casting a woman as the heroic rebel who shatters Big Blue/Big Brother marks several discursive strategies at once. In 1984, the feminist movement, though already facing some of the backlash against women in the public sphere that continues to this day, would have still have allowed for a wide familiarity with a woman as signifier of the iconoclast rule-breaker. Perhaps the principal signification visible, however, is the reference to Eve and the Garden of Eden. The Macintosh logo is the Apple with a bite out of it, with its obvious tie to the Tree of Knowledge. Invoking the Edenic myth, with its contradictions of the pain and death as well as the pleasure and knowledge the woman's act precipitates, points as well to Leo Marx's reading of the "machine in the garden." Bearing a mark, as such, also evokes the unavoidable association with the "cursed" Eve of the Old Testament, she who accepted the proffered apple and took a bite of the fruit of the forbidden Tree of Knowledge. 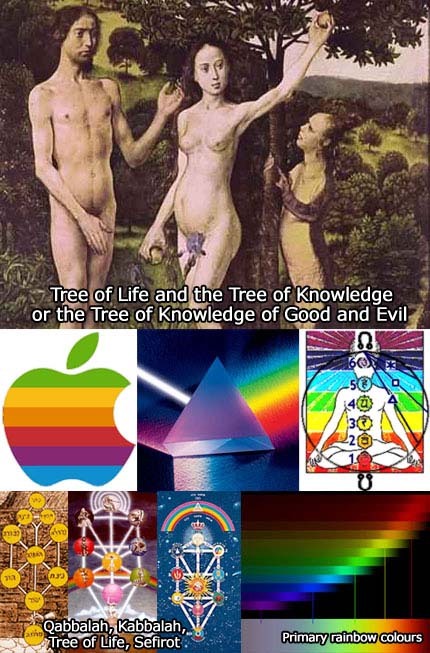 As Apple adopted the bitten apple as their corporate logo, clearly the notion of partaking of the Tree of Knowledge in the post-Edenic world that follows the bite is a privilege that supersedes the original divine injunction against knowledge. What contradictory forces do they mean? Order out of Chaos a.k.a. Thesis, Antithesis, Synthesis or Problem, Reaction, Solution? Turn everything 180 degree's around! Is God depicted as the tyrannical Big Brother and the saviour/rebel against God is "the hammer girl" (a modern "Aryan" prometheus) with a Illuminati/Communist hammer? I don't mean to judge this a Good or Evil. I just wish to highlight the possibility that these "guys" have a deep profound "occult" message to convey with their symbols and little Multimillion dollar commercials. It's not untill you begin to connect all the different threads of this information that it begins to make some sence. Please follow the provided links if you are not familliar with the topics. The Bavarian Illuminati originated during an age replete with the growing belief in the acquisition of truth through observation and experience. The Age of Enlightenment was in full swing and by the end of the Eighteenth Century an explosion of natural philosophy, science, the resurgence of hermeticism and occult experimentation, all competed directly with the traditional teachings of the Church and the Jesuit monopoly in the Universities and Colleges. Numerous ideologies owe an intellectual and political heritage to this period: skepticism, rationalism, atheism, liberalism, humanism, reductionism, modernism, communism, nihilism and anarchism - among the most apparent. As the Eighteenth Century came to a close Baron de Montesquieu (1689-1755), Denis Diderot (1713-1784), Voltaire (1694-1778), Jean-Jacques Rousseau (1712-1778), Marquis de Condorcet (1743-1794), Comte de Mirabeau (1749- 1791), David Hume (1711-1776), Adam Smith (1723-1790), Immanuel Kant (1724-1804), Emanuel Swedenborg (1688-1772) and Johann Wolfgang von Goethe (1749-1832) were famous in their own time. The instrument of reason became a new faith, no less susceptible to its own breed of dogmatism. The philosophers of the Enlightenment reasoned that the physics of Newton might become applicable in all fields of endeavor: the fundamental cosmic laws of nature could transform society and man himself into a "noble savage." The idea of a "glorious revolution" attained widespread acceptance, but during Weishaupt's time it was still a relatively new concept to link political change with social change. The "imminent revolution of the human mind," promulgated by the "radical Bavarian Illuminists," coincided with Mirabeau's doctrine of a coming secular upheaval and universal revolution. Mirabeau proclaimed Prussia to be the most likely place for the start of the revolution, with the "German Illuminists as its probable leaders." History records, however, that it was Mirabeau himself who became one of the main catalysts to spark the "fire in the minds of men" during the French Revolution. At about the same time Weishaupt was embarking on an academic career two important figures entered the world stage: Thomas Robert Malthus, born in 1766, a major influence on Darwinism, population control and the eugenics movement; four years later we see the birth of Georg Wilhelm Friedrich Hegel, in Stuttgart Germany, the inventor of what would become known as the "Hegelian Dialectic." "For Hegelians," Antony C. Sutton reports, "the State is almighty and seen as 'the march of God on earth.' Indeed, a State religion. Progress in the Hegelian State is through contrived conflict: the clash of opposites makes for progress. If you can control the opposites, you dominate the nature of the outcome" (Introduction to the 2002 edition of America's Secret Establishment: An Introduction to the Order of Skull & Bones, no pagination PDF copy).